It’s that time of year again to start thinking about your furnace. Keeping your furnace properly maintained is important to the life of your furnace levels and lasts for many years. Listed below are some tips to help you maintain your furnace in good working condition so that it doesn’t have to be replaced before its time. 1.) Examine your furnace filters and see if they need to be changed or replaced. A furnace filters job is to catch all the dust and other debris that runs through the duct to help purify the air that comes out of the vents. If a filter stays dirty for too long, your furnace will stop working efficiently and wastes more energy then what’s needed. Dirty filters may also affect the blower in severe cases, which in turn results in costly repairs. Clogged filters are one of the most common causes of furnace problems. Also, it’s imperative that you don’t forget to put the door back on properly when you’re done changing filters. 2.) Check the thermostat and make sure it’s on. The temperature settings should be set on heat and displaying the right date and time. If the furnace still doesn’t seem to be working compare the temperature setting to the room temperature and do a temperature test. To test the thermostat, set the temperature five degrees higher than the room temperature and see if the furnace kicks on. Another test you can do is replace the battery. A power outage with a dead batter will cause you to lose your settings and the thermostat will revert back to the default program. 3.) Inspect shutoff switches and breakers. Look for a regular wall switch on or near the furnace. All furnaces, no matter the age or type, will have one somewhere. Flip the switch, wait five seconds, then flip back to test. Next, check the circuit breaker or fuse for the furnace. Make sure the front panel covering the blower motor is securely fastened. There’s a push-in switch under it that must be pushed in all the way for the furnace to operate. 4.) Clear away leaves and debris from heat pumps or intake and exhaust vents. If you have a furnace that vents out the side of the house, make sure nothing is blocking the intake or exhaust. While you’re checking the vents look to see if ice is clogging one of the pipes. If there is you may have a bigger issue somewhere in the system. Call a technician to determine the problem. 5.) Schedule a tune-up each year by a licensed HVAC repair specialist to keep your furnace in tip-top shape. The best time to schedule this is early fall, before you have to turn on your furnace, to allot time for any furnace repairs that need to be done. Technicians will check your flues, ducts and temperature settings, examine your heat exchanger for cracks and other damage, and double-check all safety apparatuses to ensure proper furnace efficiency. Heating and cooling maintenance should take place regularly if you want to avoid emergency furnace repairs. 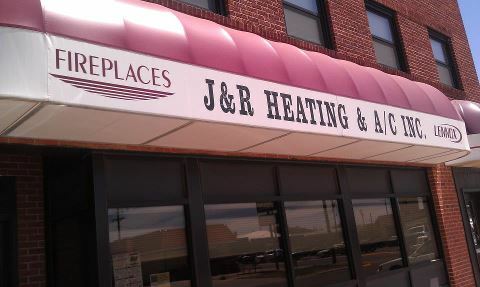 A question we get asked a lot at J & R Heating is why do higher MERV rated filters cost more money. To answer this questions it’s important to know that MERV ratings range from 1-16 and are used to rate the ability of a filter to remove particles from the air as it passes through the filter. The higher the MERV rating means fewer dust particles and other airborne contaminants passing through the filter. Oftentimes higher MERV rated filters will last longer. J & R Heating carries the Lennox Pure Air system with a Merv 16 hospital grade filter and is listed as a Consumer Digest Best Buy. For more information about filters, please contact us at jrheating.com. 1. Block drafts from windows and doors – This is best done with weather-stripping or other forms of insulation, but even a blanket in front of a door helps. 2. Let in some light. – Open blinds on South facing windows during the day to let in the sun. Close them in the evening to add a bit more insulation. 3. Use rugs on bare floors and/or wear sock and slippers in the house. 4. Bundle up. Make sure to wear layers in the winter so if your house is a little cool you will be sure to stay warm. 5. Change the furnace filter on a regular basis. A dirty filter forces the furnace to work harder, decreasing its efficiency increasing heating costs. 6. Eat warm (part 1). All those winter comfort food like soups, stews, and casseroles do much more than just fill you up. They help to fuel your inner thermostat and warm you from the inside out. 7. Eat warm (part 2). Make sure to eat foods that have been known to improve your circulation like cayenne pepper, ginger, and cinnamon. When your circulation increases it causes the body to warm up. 8. Acclimate. It may take your body a week or so to get used to the colder temperatures but it will soon be use to them. Bodies are very flexible and they learn to work within the parameters that we give them. As you spend more time outdoors your body will become acclimated to the cold and within a few days it will be able to tolerate it.